George Zimmer Got Fired. Then He Got Real Cool. The pot-smoking, night club dancing, 67-year-old ex-Men’s Wearhouse founder told us how he did it. On the night I met Men’s Wearhouse founder George Zimmer, he talked about his close relationship with marijuana and how he spent his 67th birthday “dancing like a maniac” till 2.a.m. at Mighty, an EDM nightclub in San Francisco. Zimmer has the boundless charm of a guy in the prime of life. And that’s no small feat considering he was fired from his own company — that he’d built up and led for four decades — only two years ago. It was a blow that might have crippled a man with less joie de vivre. But he’s bounced back, launching two tailoring startups in mid-2015. Zimmer, whose business cards still say “Tailor,” founded Men’s Wearhouse in 1973 with his college roommates. He became the face of the company and stacked the board with his friends and associates. They watched it grow to 1,200 stores around the U.S. and Canada. Back then, Zimmer had a different style. His beard was a sizable thing, covering much of his face, and his hair was chia-pet length. He wore the kind of suits that I associate with Men’s Wearhouse. They were fine, but a little on the baggy side — more middle class, Sunday church attire than James Bond — topped off with a dowdy, patterned tie that looked like it was inspired by the Dulles Airport carpet. Today, Zimmer’s look is way more Giorgio Armani. His suits (all from Generation Tux) are slim fitting and impeccably tailored. He wears his white hair and beard cropped closer. In photo shoots, he keeps his sunglasses on. Now, he’s like the grandfather that you’ve always wanted … to party with. His only regret, he told me, is that he can’t stop time or turn back the clock. When Zimmer got fired in 2013, it looked like he was finished. After all, it’s rare for people to start something new at his age. The Wearhouse board claimed that Zimmer kept trying to exert too much influence over the company after stepping down as CEO. Zimmer had remained a member of the board and was named Executive Chairman. The board’s letter also went on to say that Zimmer wouldn’t help the management team unless the acquiesced to his demands, that he expected veto power over the company’s most important decisions and that he wanted to take Men’s Wearhouse private. After he was ousted, Men’s Wearhouse stock prices climbed from about $37 to $58 over the following year. Wall Street investors danced on Zimmer’s prematurely unearthed grave. It’s worth noting that Zimmer owned 3.5% of the company, so his personal wealth ballooned during that time, despite the indignity. “When I was fired, I remember saying, most days you’ll be able to run this business quite well. But on those few days that you don’t know what to do, you’ll remember why I’m here,” Zimmer said. Zimmer’s warning might be ringing in the ears of Men’s Wearhouse executives these days. The company’s stock has nosedived from $65 a share in June 2015 to $21 in December 2015.
Zimmer said he’s moved on since being fired, even though he felt it deeply. “What I’ve discovered after reading Dante’s Inferno 1,000 times, is that it’s your best friends who stab you in back. Because that’s the part you leave unprotected,” he said. Zimmer had been personal friends with each board member for ten years or more. One was a friend from childhood. Another was the guru Deepak Chopra. “They were all friends …. But over time they just came to believe they could do it,” he said. Zimmer said he didn’t take home his salary after 1992. Up until that point, he had paid himself half a million a year. But he became a millionaire when the company went public. After that, he said, he donated his salary to a foundation he set up to give college scholarships to the children of Men’s Wearhouse employees. It sounds like a mashup of altruism and a good way to get tax writeoffs. But Zimmer said that limiting his own income made his upper echelon employees feel stunted — that because of him, their salaries could only swell to a certain point. “Men’s Wearhouse threw me out so that everyone could earn more money,” he said, adding that he believes that issues that are often categorized as moral end up actually being about money. He used the examples of political campaign issues, which seem like they’re tied to candidates beliefs but are probably just about pandering to lobbies and campaign donors. “I’ve learned to follow the money. Take all the (hot button) issues: gay rights, abortion, all of them — nothing has anything to do with morality. Always, when you dig deep enough, it’s all about the money,” he said. At 64-years-old, Zimmer was out.. and he tried to retire for a few months. It didn’t go very well. So he decided to start two more companies: the Millennial tuxedo rental company Generation Tux and the tailor-on-demand service, zTailors. Launching a company was relatively easy for Zimmer, after all he has personal brand recognition. Remember, Men’s Wearhouse spent a whopping $1 billion on advertisements featuring him from the mid-1980s until he was fired. But working online was a whole new ballgame. After a false start with another CTO, Matt Howland, former vice president of Tibco Software, now holds the title and that of VP. And the whole startup thing took a little getting used to, too. “The biggest challenge was that I started Men’s Wearhouse with $7,000 and the store grew with the cash flow over the years,” he said. That’s the way it used to go when someone wanted to start a business: little seed money to start, followed by expansion that reflected profits. When he started his new companies, Generation Tux and zTailors, he had to do things a little differently. “These companies had to start like any startups with a lot of cash and no business. And we had to create the systems ourselves.” The offices are based in Oakland, CA. Zimmer said he put $20 million into Generation Tux. There are 11 other investors. He also put $5 million into zTailors, a smaller company that supports Generation Tux. 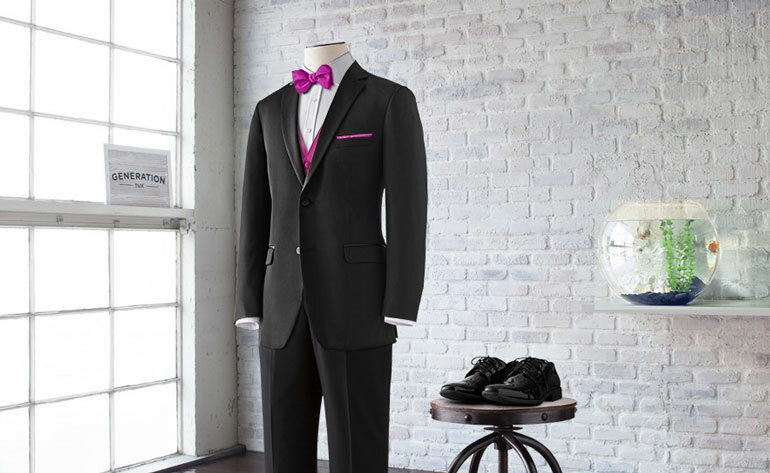 Generation Tux rents tuxedos online. Their digital customization tool lets shoppers play with the tux designs by adding flowers or lapels, and trying out different shapes and sizes. They can view this in real time. The tuxes ship for free, with a flat fee of $95 to rent. Vests and ties cost $10, shirts cost $20. The site, Zimmer said, is actually geared towards the girlfriends who want their boyfriends to look great at their wedding. “It’s the brides that are actually making most of these decisions,” he said. The site also has a tracker that can allow an anxious bride to see whether the men in the bridal party have been fitted for their tuxes yet, Zimmer said. Meanwhile, his other startup, zTailors, eliminates the need to ever visit a fitting shop. It offers on-call tailors who come customers, measure them, then whisk the clothing away and bring it back when it’s altered. Getting pants hemmed is $20, recutting a jacket is $125 and tapering a dress is $30. Pickup and delivery is free. Right now, Zimmer said, zTailors is priced low to compete with cheap tailors and gain customers. It isn’t making money yet, he said, but he believes it will in the future. By using both services, Zimmer said, someone could get their wedding tux without ever leaving the house. Before I met him, I hadn’t thought about Zimmer much, if ever. Except, I guess, during those 10 and 30-second Men’s Wearhouse commercials. But I have to say, I’m pretty impressed at the way he managed to have a second act in his life and career. When I asked him how he did it, he chalked it up to passion.